Please read this End-User License Agreement (“Agreement”) carefully before downloading or using Labor Union Regular (“Software”). By downloading or using the Software, you are agreeing to be bound by the terms and conditions of this Agreement. If you do not agree to the terms of this Agreement, do not download or use the Software. Tom McAuliffe grants you a revocable, non-exclusive, license to download, install and use the Application solely for any purpose strictly in accordance with the terms of this Agreement. a) sell the Software to any third party. This Agreement shall remain in effect until terminated by you or Tom McAuliffe. This Agreement will terminate immediately, without prior notice from Tom McAuliffe, in the event that you fail to comply with any provision of this Agreement. You may also terminate this Agreement by deleting the Application and all copies thereof from your mobile device or from your desktop. Tom McAuliffe reserves the right, at its sole discretion, to modify or replace this Agreement at any time. If a revision is material we will provide at least 30 days’ notice prior to any new terms taking effect. What constitutes a material change will be determined at our sole discretion. If you have any questions about this Agreement, please contact Tom McAuliffe at tmcauliffe@ithaca.edu. 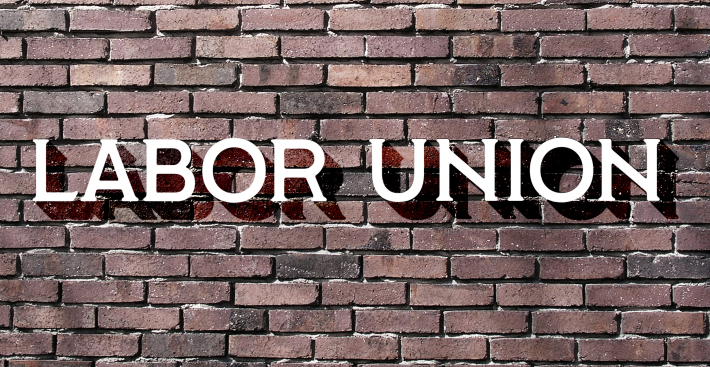 This font was made for the student-run group “Students for Labor Action” at Ithaca College. They fight for the fair treatment of employees at the college and are closely connected to the local county’s worker union (Tompkins County Workers Center). Although this font was made for any industrial use as well as anything pertaining to worker’s rights and socialism, the potential uses for this font are endless – and free for all to enjoy, as it should be. Supports 85 different languages with Latin and Cyrillic characters.